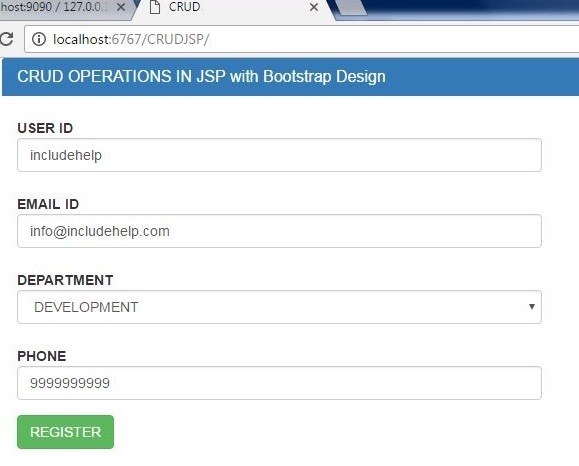 In this article, we are going to learn about CRUD (CREATE, READ, UPDATE and DELETE Operations) operations using JSP, Bootstrap and MYSQL. 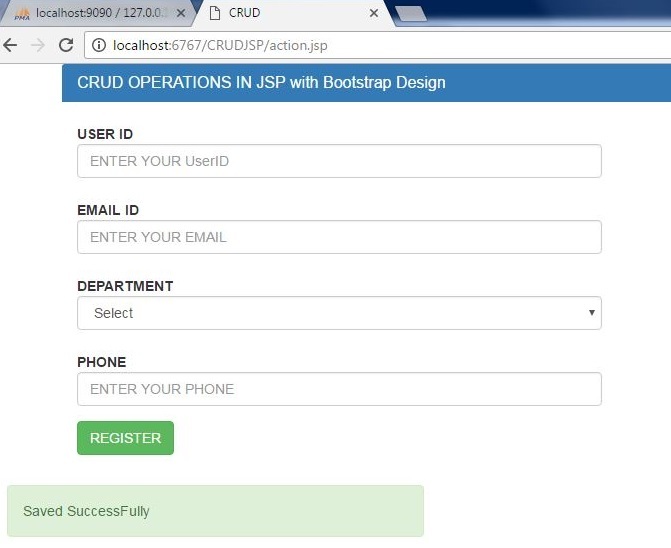 As requested by the students we are providing the CRUD operations using JSP, Bootstrap and MYSQL. The common operations that are done for any web application are CRUD, which is CREATE, READ UPDATE & DELETE. In order to develop, learn one should be very stronger to handle these operations. And it is better if one do this operations using JSP instead of Servlets. So the main difference between Servlet and JSP will be covered soon. Firstly let's get into the current one. 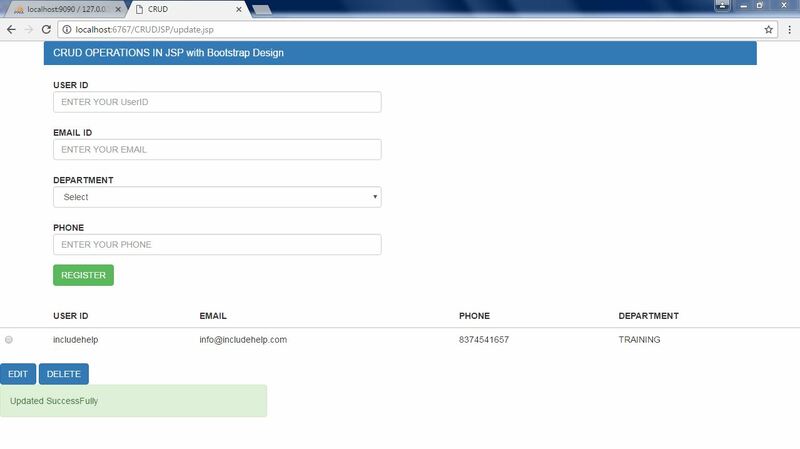 CREATE - Here, CREATE in the sense to SAVE, the inputs which we initially want to store in the database from the User. READ - Soon as we CREATE or SAVE the details in the database, we want them to access in our USER INTERFACE. So for that we have to read the saved values (which we done earlier, i.e CREATE). This READ can be achieved through a SELECT query. Note: If you want only the detail which is saved at that point then you have to make sure that you change the SELECT QUERY to the current processing USERID. UPDATE - To UPDATE the detail that is SAVED in the database, you have to CREATE a dummy page of your MAIN page with same details which are mentioned in the registration or a particular page and whenever the user clicks on EDIT button or link we should redirect to that dummy page with the values which are requested by the user to EDIT & UPDATE. DELETE - DELETE operation delete the particular record which is requested from the database. Here, we are taking the inputs from the user and triggering the action to action.jsp. This is a class providing the setter and getter methods. The service logic and database connection is created here. Here we are setting the input values to DTO (POJO) and sending the object to SERVICE method where we implements SAVE. 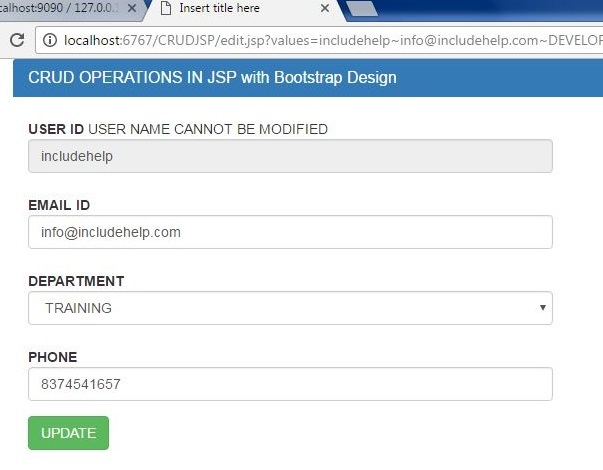 When the user clicks on EDIT button we the values binded to the radio button are sent to edit.jsp and here we took another JSP because we have to get the values from the database and bind those values to the input boxes. USERID is the primarykey, so it cannot be editable. Here we are taking the values where the edit is done and sending the values with respect to userid, which is primary key. Getting the record and sending it to the service logic and again the page is included at index.jsp.